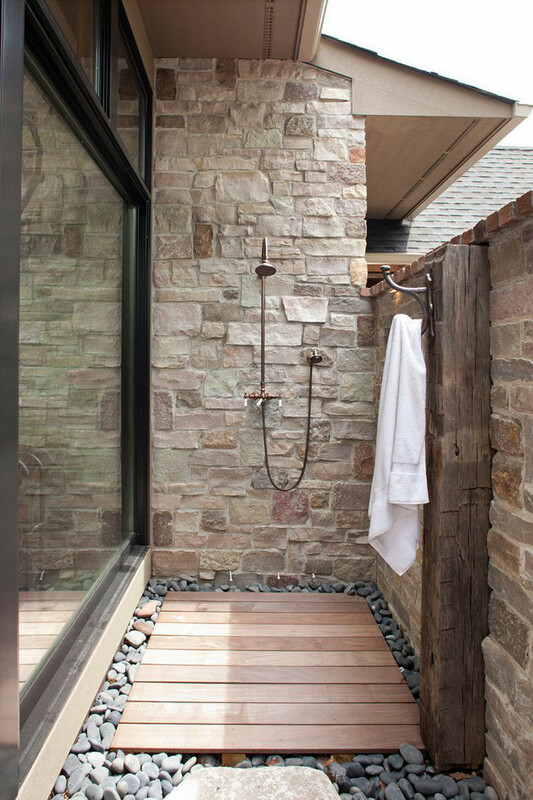 A rustic outdoor shower feels elemental — like a natural bathing adventure. While there is no rustic outdoor shower in my plans this summer — I’m busy working on a powder room expansion — building season is here. And what I find attractive about a rustic outdoor shower is the irregularity and unpredictability of the way it can be created from rough materials such as stone and rocks or be tucked onto the side of a house with the siding as a backdrop. 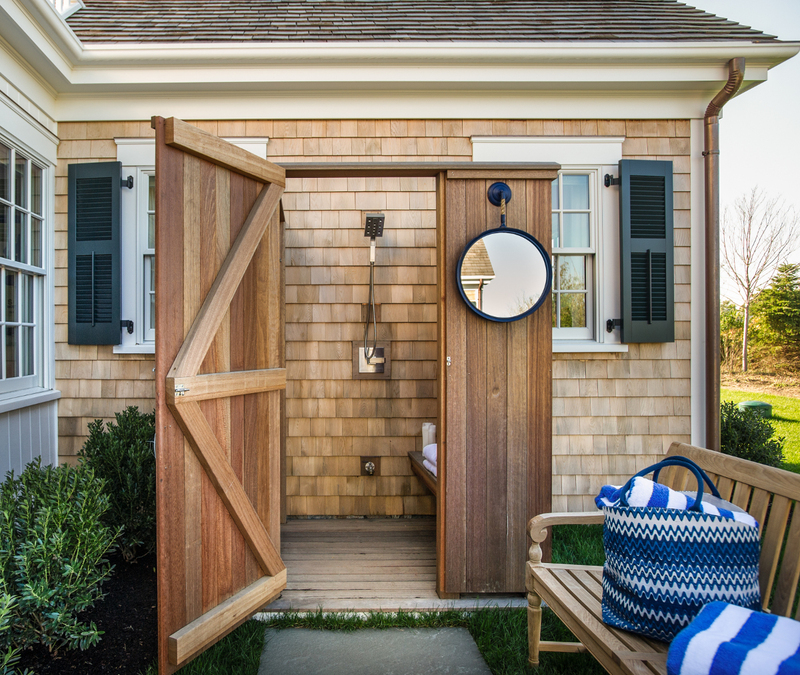 A simple but elemental shower was built behind a Martha’s Vineyard beach house, between two windows with the three-sided cedar partition and wood-slat floor right up against the house. A hand shower — plus a low spigot dedicated to washing sand off the feet — offer flexibility. There’s a handy bench inside the enclosure and a surface-mounted mirror outside which likely needs to be covered in the winter. The house, designed by Linda Woodrum, was a sophisticated hgtv dream home that was opened for tours. This virtual peek while presents an easy DIY blueprint. 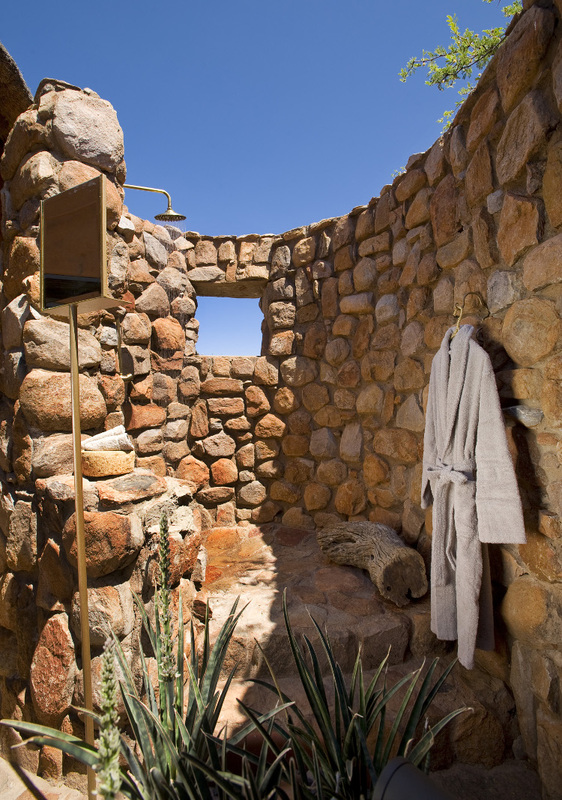 At first, I thought this shower might be located in Arizona or New Mexico but the location is far more exotic —Tswalu in the Kalahari desert of South Africa. How I love the elemental look of this shower with the wonderful little window to look out over the view of South Africa’s largest private game preserve. Each cottage on the property has an outdoor shower. This fortress like beauty is unforgettable. 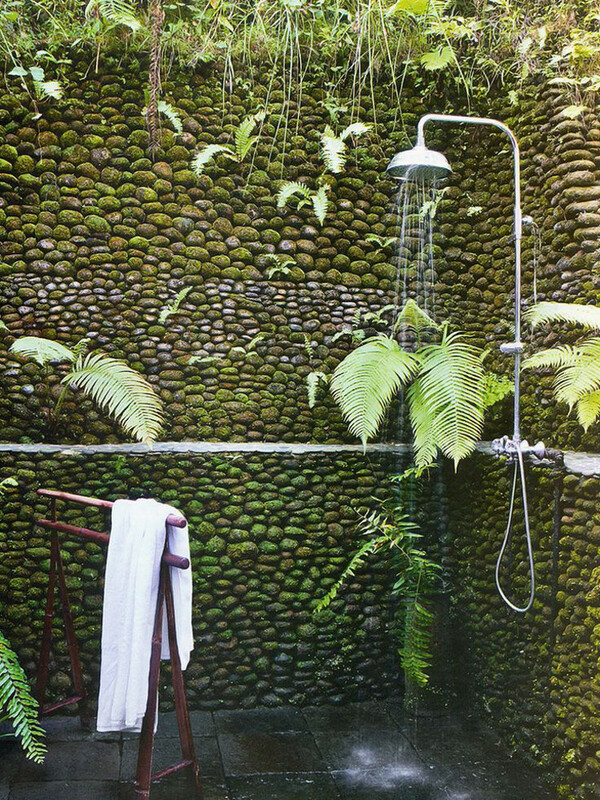 Gray stone walls of an outdoor shower in Bali are naturally tinted green from plant life budding on the rocks. The shower tower sits unceremoniously on exposed plumbing pipes which are anchored to the stone wall. A bamboo towel rack suggests that this could be located in a corner of a garden making it informal as well as rustic. Minnesota summers must be warm to make use of an outdoor shower off the master bath. Here, a tower and separate hand shower are tucked into a brick and stone alcove of a lake house built by John Kraemer & Sons. A simple planked platform over stone provides drainage and a glass door to the left of the picture window gives the owner easy access to the bedroom after a swim.